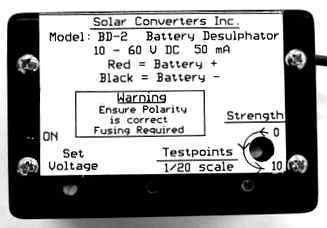 39 Battery Desulphator by Solar Converters, Inc.
the charge/discharge cycles are not suited to the battery(s). plates which reduce the battery capacity. This breaks away the crystals so they may dissolve into the electrolyte. Battery life is also extended. They can be customized to your battery(s). It also allows you to reduce any interference caused by the desulphator. the battery is near full. > Efficiency is greater than 96% over 20% pulse load. > Dimensions: 3" by 2" by 1.5"
to the set point on the unit. when the system is being charged. discharge/discharge cycles are not well suited for the battery. reducing its charging and discharge capability. This unit uses a sharp pulse of current forced into the battery suddenly to "jar"
sharp pulse of current, which is adjustable by the user. with equipment connected to the unit. This unit requires an external 0.5 amp fuse in line fuse. battery positive and the black wire to battery negative. 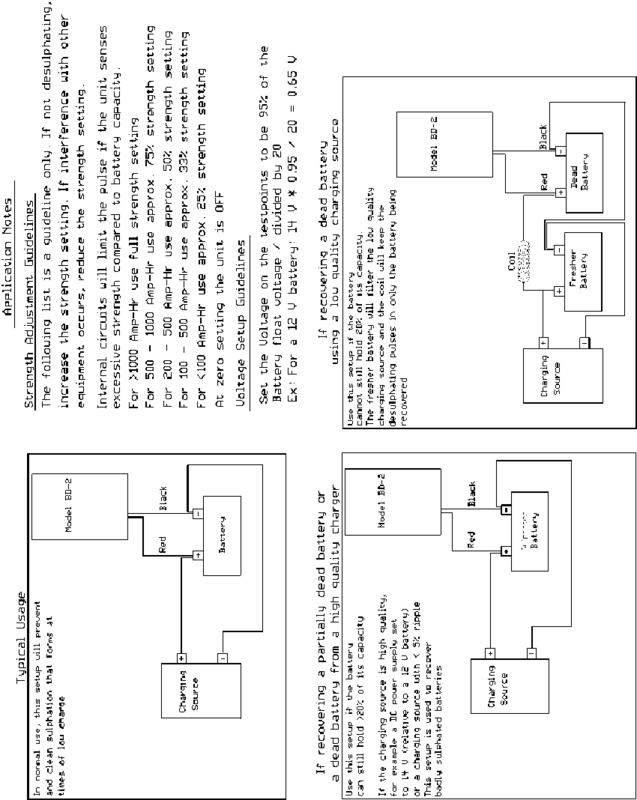 This unit has 2 adjustments, one for pulse strength, and one for turn on voltage. to operate the unit at. This is usually 95 % of the battery float voltage. This voltage (1/20th scale) is the setting of the V-on pot. Adjust the set pot to set the desired voltage calculated above. The unit will now operate only when the voltage is above this set voltage. For example, a 12 V battery floats at 14 V.
Thus the unit should operate at above 13.5 V (14 * .955). voltage set voltage using a small screwdriver to 0.65 V (13.5 /20 = 0.65 V). It is factory set to 0.65 V for 12 V batteries. The Pot marked strength controls the magnitude of the current pulse. Its usual setting is in the middle for a 5-amp pulse. By moving the Pot to 0, the unit puts out 0 amp pulses (essentially off). By moving the POT full to 10, the unit puts out 10 amp pulses. For more detail, please see drawing on page 3.
benefits of the desulphation action. different health to begin with. 1) New batteries or batteries that will still hold over 25 % charge. No special care is required of the setup. as they go through their usual charge/ discharge cycles. recover the battery must be taken. the capacity to “tame” the higher voltage pulses these units put out. charge controller attached to it. Connect the desulphator to the bad battery. voltage or damaged by the voltage wide variations of a lower quality charger source. need for an additional battery to tame the charger. put your cursor in the center and print it as a picture. You will get the best results printing it this way.